Excellent, always very efficient, artistic, and produces great designs, with good turn around. Use this provider! 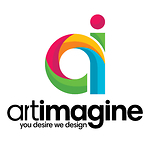 I absolutely love the logo artimagine has done for me. Great communication throughout. He was able to get exactly what I was after and complete it to a very high standard. Super fast service. Revisions were made really quickly, just as I wanted. I requested a logo and a first draft was provided and I stated my changes but when I received the changes it was basic with no effort or thought. I requested a change again and was told like he would come back with a new update but I'm still waiting that was nearly a month ago.